Situated at the very eastern tip of the Americas, Joao Pessoa is indeed, as its nickname suggests, "the city where the sun rises first." Known for its exceptional integration with nature, the city ranks as the greenest capital in Brazil, with countless parks and even an Atlantic rainforest reserve within its bounds. 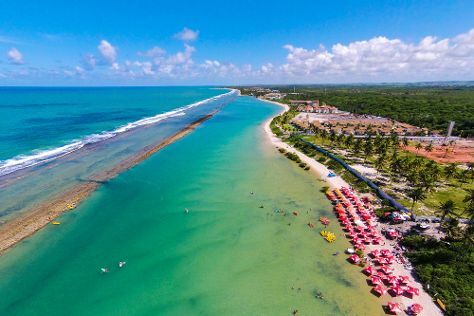 Get out of town with these interesting Joao Pessoa side-trips: Conde (Coqueirinho Beach, Barra do Gramame Beach, & more). And it doesn't end there: kick back and relax at Praia do Jacare, take in the architecture and atmosphere at Igreja Sao Francisco, stroll through Bessa Beach, and examine the collection at Cultural Center Sao Francisco. For where to stay, photos, reviews, and tourist information, refer to the Joao Pessoa trip planner. Sao Paulo to Joao Pessoa is an approximately 5-hour flight. You can also do a combination of bus and flight; or drive. Traveling from Sao Paulo in August, expect Joao Pessoa to be a bit warmer, temps between 33°C and 24°C. Finish your sightseeing early on the 17th (Sat) so you can drive to Recife. Once the capital of Dutch Brazil, Recife has a history spanning back to 1537, when it was little more than a handful of fishing houses on the beach. Venture out of the city with trips to Carneiros Beach (in Tamandare) and Porto de Galinhas (Natural Pools of Porto de Galinhas, Pontal de Maracaipe, & more). There's lots more to do: see the interesting displays at Instituto Ricardo Brennand, gain insight at Oficina Ceramica Francisco Brennand, and get to know the fascinating history of Recife Antigo. To find where to stay, other places to visit, and tourist information, read our Recife trip itinerary planning app . Getting from Joao Pessoa to Recife by car takes about 2 hours. Other options: fly; or take a bus. In August, daily temperatures in Recife can reach 32°C, while at night they dip to 26°C. Wrap up your sightseeing on the 22nd (Thu) early enough to travel to Maceio. Explore the numerous day-trip ideas around Maceio: Praia de Sao Miguel dos Milagres (in Sao Miguel dos Milagres), Paripueira Beach (in Paripueira) and Gunga Beach (in Roteiro). And it doesn't end there: stroll through Frances Beach, kick back and relax at Marape Dunes, learn more about the world around you at Usina Ciencia - UFAL, and browse the eclectic array of goods at Craft Fair of Pajucara. To see photos, other places to visit, maps, and tourist information, go to the Maceio driving holiday planner. Fly from Recife to Maceio in 2 hours. Alternatively, you can drive; or take a bus. Traveling from Recife in August, expect a bit cooler with lows of 22°C in Maceio. On the 28th (Wed), wrap the sightseeing up by early afternoon so you can travel back home.